Burials were almost certainly made in the Walker Cemetery (which we believe is also the site of the New Harmony Regular Baptist Church) by the late 1830's. George Walker purchased the southwest quarter of section 8 in March 1834 for $125. The first death in Walker township was Miss Emily Ham, and George Walker made the coffin. George Walker built the log church and established the burial ground which took his name. In February 1895, James M. & Henrietta Jenkins (a daughter of Elder George Walker) gave the cemetery to Hancock County. The deed states that it had been surveyed and platted by Joshua C. Berry on Feb. 10, 1886 (Note: We've found and copied a government survey done by J. C. Berry in 1868). The cemetery is composed of two parts - the "Old Cemetery" containing .79 acre - and the "Addition" containing .80 acre - or a total of 1.59 acres. Deeds exhibit the fact that a right of way, 80 rods in length, and four rods in width, from the main road to the entrance of the cemetery, was also given to the county at that time. The actual dimensions of the four sides of the cemetery are as follows: west side 406.56 feet; north side 177.54 feet; east side 413.16 feet; south side 169.98 feet. 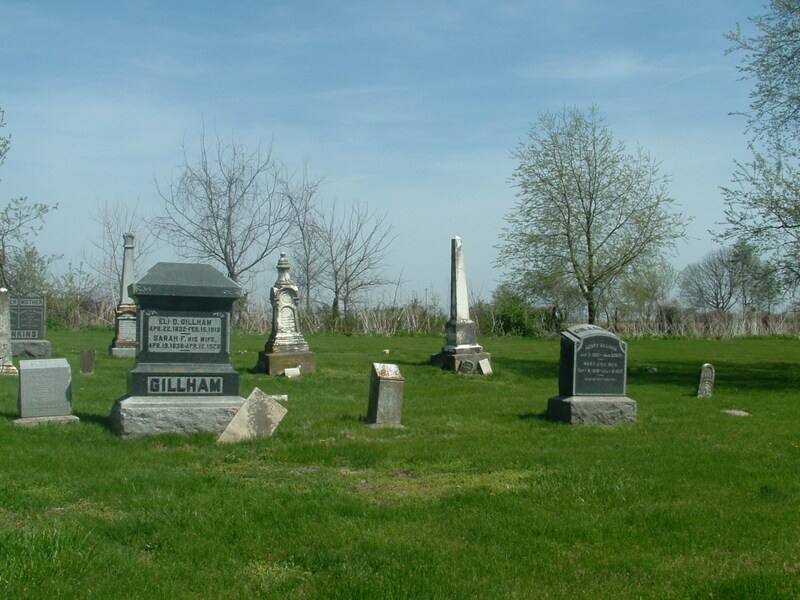 The deed stipulates that the county may make all needful and reasonable rules and regulations to carry out the intention of the free use of the cemetery; and that the county shall at all times keep the cemetery fenced, and make repairs or renewals of the fence; or, if it should be ceased to be used and cared for it should revert to the heirs. ALLEN, Christopher. Co. H, 118th Ill. Inf. No dates. Pvt. Civil War. ATKINSON, Elizabeth A., wife of W. S. Atkinson. Died August 23, 1872, age 19 years, -- mo., -- days. BROUGH, John L. Oct. 25, 1838 - Mar. 30, 1900. BATTELS, Edward. Apr. 2, 1803 - Nov. 4, 1882. Age 79 y 7 m 2 d.
BATTELS, Elizabeth. Born Jan. 7, 1805. Apr. 13, 1883. Aged 78 y, 8 m 6 d.
BAKER, Ida May. Mar. 7, 1897. Nov. 1897. CARTER, Phillip L. January 17, 1813. July 27, 1876. CLARK, John W. Born 1818 - Died 1850. Son of Daniel and Nancy Walker Clark. Member of the Farmers Guard of the Illinois Militia, in June 1844. Married Theresa M. Williams (daughter of Col. Levi Williams and wife Mary) in 1838. Stone and base are broken, found several of the pieces. DAVIS, Stephanie. Died Jan. 12, 1852, aged 30 yr, 4m, 12d. Dau. of H. & A. Davis. DILLON, Victoria L. Oct. 28, 1889 - Feb. 15, 1916. "Just as the morning of her life was opening into day, her young and lovely spirit passed from earth and grief away." DILLON, Viola A. Wife of E. Augustine, 1874-1925. DOOLEY, Mary. 1865-1939. At rest. DOUGHTY, George E. Nov. 17, 1878 - Mar 4, 1910. DOUGHTY, Hannah L., wife of George. Feb. 3, 1897. DOUGHTY, Z. Taylor. 1850-1881. D. Nov. 29, 1881. Age 31 y.
DOUGHTY, Baby d. June 4, 18__. DOUGHTY, Ethel. Jan. 16, 1881. Age 6 month. Dau. of Etta and Taylor. DOUGHTY, Charles. Apr. 25, 1882. Age 6 mo. Son of Z. Taylor and Etta Doughty. EWING, Elizabeth Fuller. Feb. 9, 1819 - Apr 2, 1861. Age ----. Wife of John P.
EWING, John P. March 8, 1824 - July 1, 1903. EWING, Margaret Jane Stucker. Mar 5, 1858 - Apr 18, 1925. Wife of John P. Erected by Margaret Ewing. EWING, Oliver Perry. d. Nov. 19, 1865. Aged 4 mo 6 d. Son of J. P. & E.
NAME GONE, Dau. of J. P. & E. Ewing. 15 yrs. EWING, Maude B. 1818-1853. "On earth we shall see her no more, she has gone to her home in heaven, and all her afflictions are over." EWING, William G. Sep. 5, 1855 - May 25, 1921. EWING, Mary F. Jul 21, 1856 - Jan. 9, 1914. Wife of William. EWING, Merritt R. D June 15, 1880, aged 1 y 6 m 6 d. Son of W. S. & Mary Ewing. EWING, Effie Iona. July 16, 1892 - Sep 25, 1903. "All is dark within our dwelling. Lonely are our hearts today. For the one we loved so dearly, Has forever passed away." GILLHAM, Ann Eliza. Born in Sutter County, California. Dau. of J & A. R. Aged 3 y 1 m 7 d.
GILLHAM, Mary Jane Ewing. Sep. 8, 1828 - Jul. 2, 1907. Wife of Henry. "Gone but not forgotten." GILLHAM, Henry. Jan. 3, 1827 - Jan. 2, 1910. GILLHAM, George. Sep. 12, 18--. Son of E. D. & S. F.
GILLHAM, George W. Son of R. A. & Elizabeth Gillham. D. Sep 25, 18__. Aged 1 y 2 m 10 d.
GILLHAM, Elizabeth R. "Lizzie." Aug. 22, 1862 - Nov. 13, 1873. GILLHAM, Etta Florence. Feb. 11, 1869. Age 7 ds. Dau. of E. D. & S. F.
GILLHAM, Henry Jackson. Jan. 13, 18__. Age 4 y 3 m 27 d. Son of H & M Gillham. GILLHAM, A. Delbert. Inf. son of J. & A. b/d Sep 13, 1866. GILLHAM, Ida Eudora. Dec. 27, 1866 - Feb. 18, 1918. GILLHAM, Eli D. Apr. 22, 1832 - Feb. 15, 1918. GILLHAM, Sarah F. Apr. 19, 1836 - Apr. 12, 1928. Wife of E. D.
GILLHAM, Elizabeth. Aug. 23, 1812. D. 19 yr 1m 16d. GILLHAM, Charles M. Dec 3, 1858 - Feb 27, 1875. GILLHAM, Infant dau. of E. D. & S. F. Gillham. Jul. 19, 1871. GILLHAM, Infant son of E. D. & S. F. Gillham. Jul. 22, 1871. Age 3d. HOPKINS, Alry A. Died May 1, 1872, Age 24y 6 m 8 d. Wife of T. W. Hopkins. HOPKINS, Anna A. Barnes. b. Oct. 23, 1847 d. May 1, 1872. HUGHES, George J. 1835 - 1928. HUGHES, Matilda Battels (his wife), 1838 - 1892. Died July 20, 1892, aged 54 years, 1 mo., 11 days. HUGHES, Elizabeth B. 1864 - 1896. HUGHES, Harriet B. 1866 - 1867. HUTCHISON, Jefferson. Dec. 17, 1875. Age 13 y 1 m 24 d. Son of M. L. & C. Hutchison. HUTCHISON, Elizabeth E. Aug. 18, 1865 - Jul. 2, 1866. Dau. of L. & C.
HUTCHISON, Lawrence. Sep 13, 1835 - Jan. 8, 1909. HUTCHISON, Caroline Battles. Mar. 1, 1831 - Sep. 19, 1906. Wife of Lawrence. HUTCHISON, Cordelia A. Markley. June 4, 1873 - Jan. 31, 1934. Wife of Reuben. HUTCHISON, Reuben A. Apr. 10, 1873 - Jun. 25, 1940. HUTCHISON, Flora A. Whitledge. Oct. 13, 1875 - Oct. 4, 1925. HUTCHISON, Edward B. Mar. 22, 1868 - May 4, 1940. HUTCHISON, Eliza Beth. Aug. 29, 1829 - Aug 23, 1872. Wife of W. S.
HUTCHISON, Baby. Aug. 23, 1872. HUTCHISON, Son of R. A. & C. Hutchison. May 4, 1896 - Aug 24, 1897. JENKINS, Henrietta. Sep. 25, 1850 - Apr. 21, 1903. "Mother"
JENKINS, James M. Aug 5, 1853 - Oct. 8, 1905. "Father"
JONES, Edith A. Sep. 21, 1909 - Feb. 9, 1910. Dau. of R. A. & A. E.
KINKADE, Mary Lockwood. Feb. 1852 - Jul. 1881. LAMBERTH, John A. Aug. 8, 1872 - May 7, 1891. Son of N. & N. J. Lamberth. MAIRS, Elizabeth. July 13, 1836 - Sep 26, 1906. Wife of A. M. "Mother"
PERRY, Ann. Not sure of name - stone is almost illegible. --------, Eliza. Not sure of writing on stone - almost illegible. RICH, Eliza Ann. Wife of James Rich. D. Oct. 12, 1876. RUNYAN, Charlotte L. Daughter of F & M Runyan. Small stone (footstone size), broken. Bottom part of stone not yet found, but appears on earlier burial lists: d. Apr 7, 1854, age 23 days. RUNYAN, Mary. Dec. 16, --. Aged 25 y 2 m 6 d. Wife of Franklin. TAYLOR, Etta. B. Sep. 23, 1853. WALKER, ELDER GEORGE. Feb. 29, 1804 - Oct. 9, 1879. Born in Maryland. WALKER, Rachel Clark. June 27, 1808 - Oct. 9, 1883. WALKER, Mary. Died Mar. 10, 1845. Wife of John Walker. Aged 65 y 8 m 29 d.
WALKER, Matilda. Second wife of John Walker. WALKER, James E. Jun. 5, 1835 - Aug. 2, 1843. Son of G. & R. Walker. WALKER, Lucy. 1858. Dau. of George and Rachel. WALKER, Rose. Aug 10, 1863, aged 7y 10 m 3 d. Dau. of George & Rachel. WALKER, Talitha. Wife of Charles P. Walker. May 29, 1855 - Sep. 20, 1881. Born in Warren Co., Ill.
WALKER, Bel. D. July 24, 1858. Age 11 m. 24 d.
WALLACE, James H. March 2, 1865. Aged 3 y 8d. Son of T. & H. A. Wallace. WALLACE, Julie E. Aug. 11, 1856. Age 6 m 11 d. Dau. of T. & H. A. Wallace. WALLACE, Jacob. D. M 11, 1865, aged 21 y 11m 15d. YORK, Eliza. Feb. 18, 1815 - Jan. 9, 1879. "Sacred to Memory of"
ALLEN, David Robert. Born December 7, 1840. Died November 17, 1873. Husband of Harriet Elizabeth Stevenson. Son of Daniel and Sarah Allen. LAYMON, Rachel Thurston. Born 1796. Wife of Elder David Laymon. ALLEN, Sarah Jane Laymon. Born 1817 in Indiana, Died in Hancock Co., IL. Son of David and Rachel Laymon. Wife of Daniel A. Allen. ALLEN, Daniel A. Born 1812 in Ohio, Died in 1851 in Hancock Co., IL. KINKADE, Harry L. Died March 28, 1878. LEWONS, ----. Died August 22, 1878. MORRIS, Ellen A. Died January 1, 1882, aged 70 years, 3 mo., 4 days.